MOSCOW, Idaho – Idaho football was not spared the irrevocable calculus of spring. Addition and subtraction, as ever, ruled spring ball. Whether the sum is in the Vandals’ favor or against them remains to be determined next fall. The biggest loss was the sudden departure of senior linebacker Tony Lashley. A Sun Belt all-conference selection last year, Lashley was in line to be a premier inside linebacker in the Big Sky Conference, where the Vandals will begin playing again after two decades as a Football Bowl Subdivision team. After going through spring practice, though, Lashley is taking a graduate transfer option and will play his final season of college football at Boise State. Petrino said Idaho is set at linebacker even without Lashley. All-Sun Belt second-teamer Kaden Elliss and honorable mention Ed Hall return as starters. Christian Elliss and Ty Graham, who played extensively as reserves last year but missed spring practice while rehabilitating injuries, will return. “I feel good about the depth,” Petrino said. A major goal of spring ball was getting Idaho’s three quarterbacks to the point where they can be counted on to win games. Junior Mason Petrino, sophomore Colton Richardson and redshirt freshman Dylan Lemle all made strides, the coach said. “I have a good feel for what each can do,” coach Petrino said. Richardson and Petrino are the front-runners. Richardson excels in Idaho’s quick passing game and Petrino was effective all spring in moving the team in the run-pass game. “(Richardson) has really good accuracy,” coach Petrino said. The Vandals were also hit hard by injury at running back. Senior Isaiah Saunders, projected to be a starter, missed most of spring practice after injuring an ankle in a scrimmage. Dylan Thigpen stepped up and was having an impressive spring until he suffered an apparently serious knee injury in the spring game. “I feel terrible for Thigpen. He was having a great spring. He was working so hard,” Petrino said. Idaho will decide whether to redshirt Thigpen after seeing the course of his rehabilitation this summer. Rodshaun Johnson replaced Thigpen and rushed for 124 yards and three touchdowns in the spring game. Jack Bamis, working with the second-team offense in that game, carried 22 times for 63 yards and a touchdown. After the offensive line played inconsistently last season, strengthening it was a priority this spring. 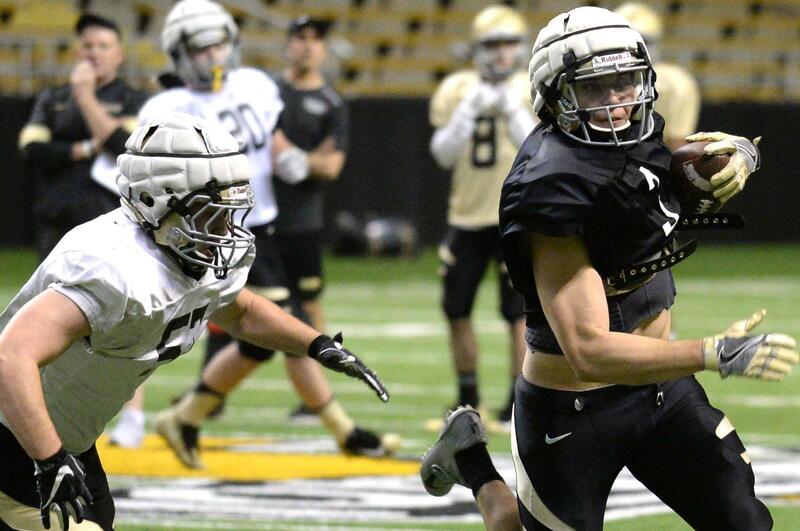 Idaho emerged from spring practice with a rotation of eight players. “There was a lot of toughness, grit,” Petrino said. Also, the Vandals will get back a couple of key performers from last year – Noah Johnson, a junior, and Connor Vrba, a redshirt sophomore, who sat out spring ball with injuries. The biggest spring story for the Vandals was what an amazing weapon Elliss can be. Last year, in addition to leading the Sun Belt with 15 solo tackles for loss, he lined up at defensive end as well as linebacker and blocked an extra-point attempt against Appalachian State. Elliss also played on offense. As a tight end and slot receiver, he made seven catches for 156 yards and two touchdowns. He became the first FBS player to record a sack and a touchdown in the same game since 2013. That only foreshadowed what he did this spring. Elliss put on about 15 pounds since last season and is now listed at 240. It hasn’t slowed him. In addition to playing defense, the Vandals used Elliss as a tight end, slot receiver, wide receiver and running back. In the spring game he made five receptions for 141 yards, including an 80-yard touchdown reception from Richardson. Elliss’ uncanny ability to learn positions quickly makes it possible for the Vandals to have him on the field, but he remains a defensive player first. “I’m going to play him as much as he can handle on offense,” Petrino said. Published: May 2, 2018, 6:40 p.m.